Looking for ideas for cardmaking? Think of this page as a starting point. Who knows where it may lead you! Making a handmade card is fun and an extra special way of saying you care. Rather than picking a card off a shelf that "just about" suits someone, why not make the card yourself. It will be unique and individual. Use your relationship with the person who will receive it as the blueprint for your design. Base the theme on their likes, interests or hobbies. You can personalise it! Use their name, age, gender and even add your own poem or words of love. The thrill of knowing you have put in the thought, time and effort - JUST FOR THEM! - is fantastic. Choose a card stock that fits the occasion. A nice HAMMER or LINEN finish in White or Cream for a Wedding or Anniversary works well. Girly pinks and blue for a boy may be obvious ideas for cardmaking but they work. Mums may like purple or lavender, peach or pink whether it's for a birthday or mothers day. Colour schemes for dads, brothers and men in general can be tricky, but don't have to be dull! Copper, Teal and Charcoal are available in some super finishes. For birthday or fathers day the choice is yours. There are Pearly finishes,leather look, marbled, glitter, matt, patterned -the list of colour and textural ideas for cardmaking is endless! 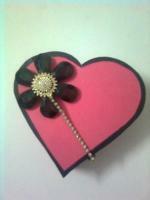 Embellishments - the items you stick onto the greeting card - come in lots of shapes, colours and themes. They can be made from paper, card, fabric, wire, fimo, plastic, metal, natural materials (such as straw and pressed flowers) and foam to list but a few. How about using flat-backed gem stones, ribbons, seeds, sequins, peel off stickers, fibres, buttons or beads? Stamping with inks is very popular at the moment and you can achieve some fantastic effects. 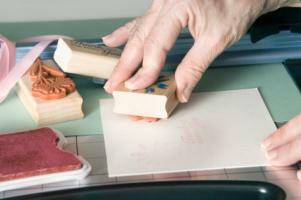 There are plenty of stamp blocks to choose from. Your local craft shop should sell them or look online. One lady I know uses a watercolour stamp and produces beautiful cards that look like a hand painted watercolour! Why not have a go at embossing? Another way of making your greeting card standout is by using an embossing tool or special paint that puffs up when heated. Look it up - find out more - go on I dare you! Originally this was a way of crafting with wood but has become well known in card crafting using papers. Really it's a layering process to build an image. Many copies of the same design are cut out and attached atop each other to form a 3D image. You work from distant to foreground and the topmost layers may only have tiny details stuck into place. Have you heard of tea bag folding? No, you don't use those soggy things that come out of your cup of tea. It is a form of origami using decorative paper squares. Tea bag folding is named after the pretty envelopes that enclosed tea bags in the Netherlands. Another papercraft that originated in the Netherlands is Iris folding. 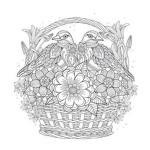 Although simple, these intricate, spiraling designs are beautiful. They remind me of the overlapping shutters of a camera iris (yes I'm old enough to remember REAL cameras). Another idea is to find a local craft centre that runs workshops, a good place to start learning any craft. They provide hands on support and encouragement from people in the know. But you can also find card making starter packs on most high streets if you just want to play around at home! 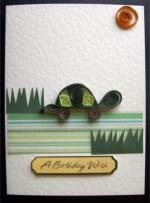 Hopefully these basic ideas for cardmaking will give you the incentive to try something new and exciting.